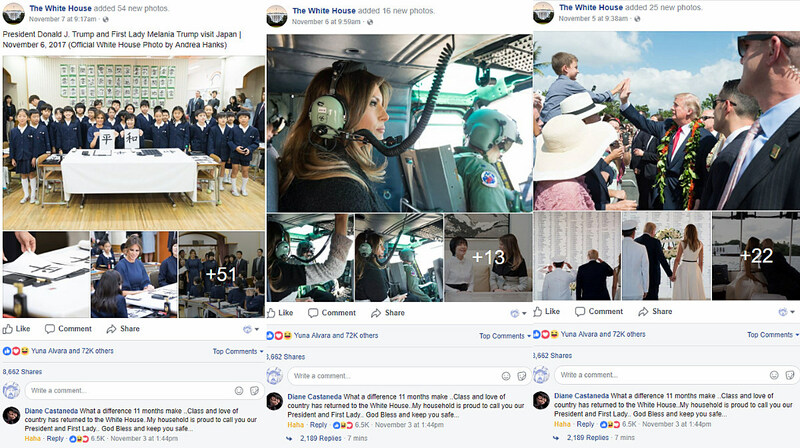 I accidentally noticed a few similarities in comments on The White House's official Facebook page, and after looking a bit closer I realized that it's no coincidence. No matter whether you love him or hate him, I think we can all agree that President Donald J. Trump has quite the ego. Long before his political aspirations, people often joked about him slapping his name on everything and his braggadocious nature. The guy thinks pretty highly of himself, and I don't think anyone would deny that. It is this specific character trait about Trump that makes this pattern I stumbled across seem, well, more than a little fishy. If you asked me to guess an adjective that Trump supporters would use to describe the President, I wouldn't guess "classy" even with a hundred guesses. It's just not a word I associate with the man, nor would I expect others to. I mean, his house looks like King Midas humped everything in it, he wears ill-fitting suits, insults anyone that disagrees with him, and likes his steak well done and swimming in ketchup. Those aren't exactly the things you associate with someone who is elegant, stylish, or has/reflects high standards of personal behavior, as the dictionary puts it. 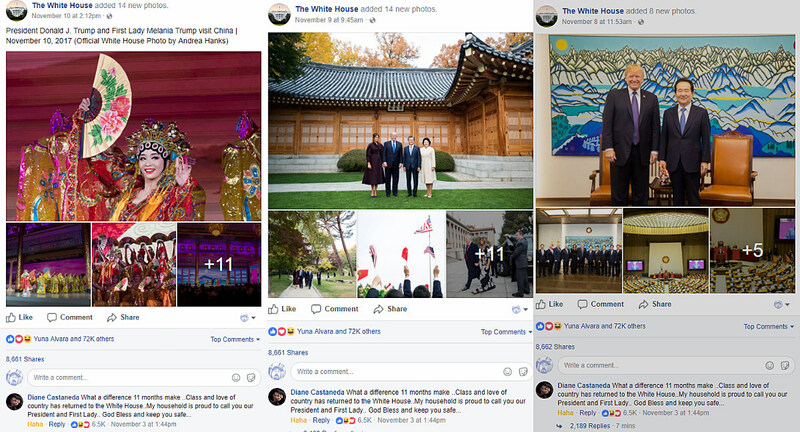 So, keeping that in mind, see if you can spot the similarity in these Facebook posts from The White House's Facebook page. In case you couldn't figure it out -- the similarity is this exact same comment from the same person being the top comment on all of them. 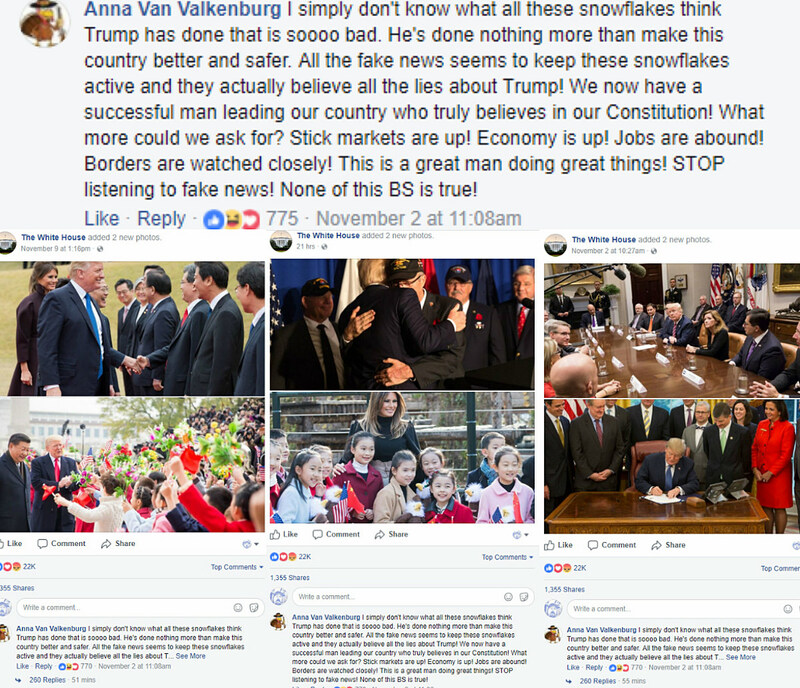 It's the top comment because other people have spotted this for what it is -- fake news -- and commented in response, therefore making it the top comments on a bunch of posts. Those aren't the only three wearing that comment either. Here are a few more places I found the comment in just a brief stroll through the timeline. 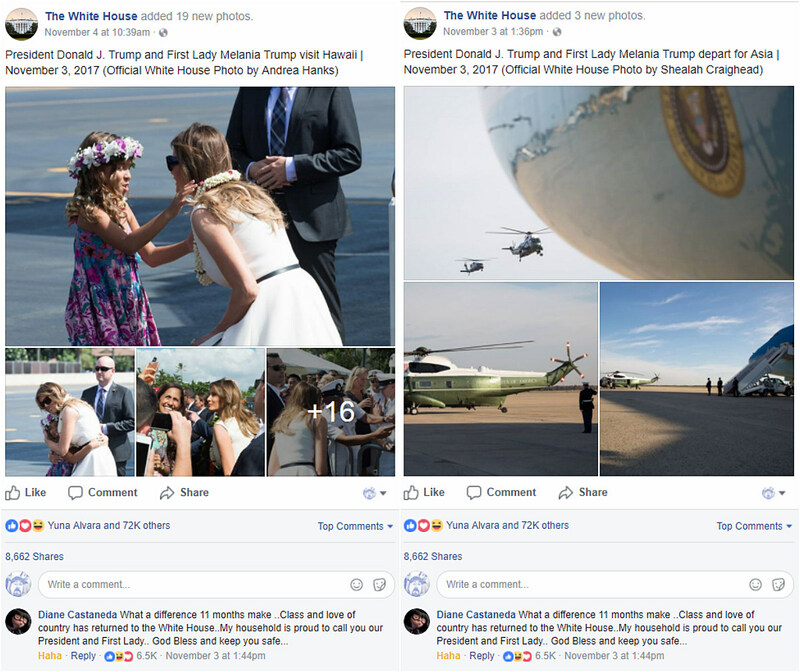 Now, I'm not saying that there's nobody that thinks the President and First Lady are classy, but nobody thinks they're so classy that they'll repeat the same exact post day after day on The White House Facebook page. You know who would definitely do that though? Someone with a huge ego that wants people to think he's classy. I'm just saying, do the math. It points heavily in a certain direction. 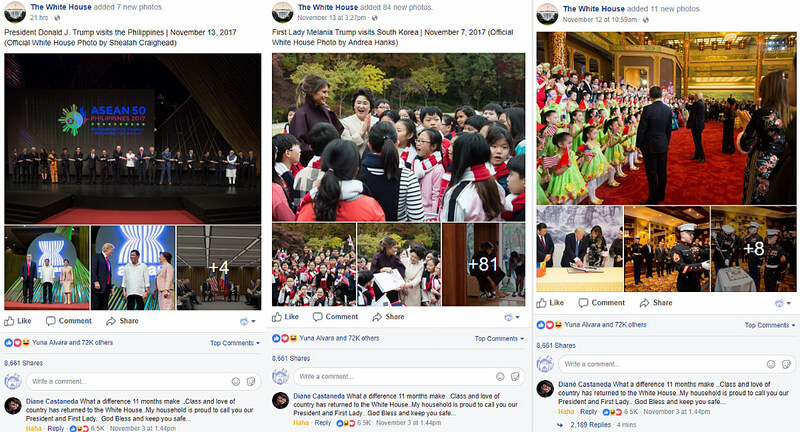 Diane Castaneda's comment wasn't the only one I saw multiple times in my brief audit of The White House timeline, there was also this one. Gee, where have I heard this stuff before? Obviously, I'm kidding. This sounds like a greatest hits compilation of Trump tweets. I don't know if these are real people, bots, GOP trolls or what, but I have a pretty good hunch on who's behind them and there's really only one thing to say to that person.